What's all the "buzz" about the "Buzz" defense? This article discusses coach Mike Divilbiss's "Buzz" DVD and the Buzz defense. Coach Divilbiss also calls this the "Twilight Zone" defense, which is a variation of the 2-3 zone defense. This zone defense puts defenders in the passing lanes, rather than directly on the ball and causes the offense to make lob (instead of straight line) passes, and "forces the action." It is an aggressive defense that forces teams that like to delay and slow the pace of the game, to pick up their tempo, resulting if quick outside shots, long rebounds and opportunities for easy baskets in transition (off steals and long rebounds). 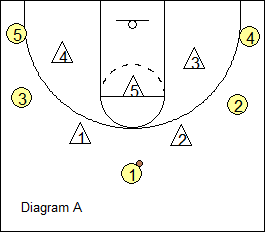 It collapses in the paint on dribble-penetration and forces outside shots. Get the DVD! If you are serious about using this defense, you must get Coach Mike Divilbiss's excellent DVD below. The DVD shows on-court 5-on-5 demonstrations of how players play the passing lanes, rotate, etc with Coach Divilbiss stopping play and making comments and corrections. with Mike Divilbiss, assistant women's coach at University of Wisconsin-Green Bay, former head women's coach at the University of Idaho. Uses your team's athleticism. Good quick athletic defenders like to play this defense, and you don't necessarily need a tall inside post defender. Opponent's players have difficulty making good inside passes and accurate skip passes with defenders playing in the passing lanes. Forces tempo and opponents tend to rush shots. Works well against patterned offenses. Protects your "bigs" from foul trouble... usually teams will commit fewer fouls when playing this zone defense. Easy to disguise this defense. Good rebounding opportunities which help get your fast break started. 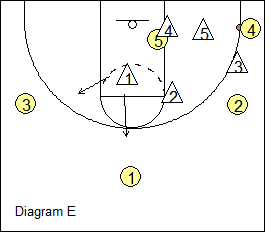 Forces the offense to play away from the basket. It's hard to get the ball inside. The defense starts with a 2-3 zone look (diagram A). X2 is your taller guard and plays on the right side as most point guards tend to go more to their right and pass to their right. X1 is the left guard. X5 is probably your tallest player, but also needs to be able to sprint and move quickly. X5's main rule is to always stay in a direct line between the ball and the basket. X4 is your best rebounder, so we put him/her on the back-side where 70% of missed shots (from the right wing and corner) tend to go. 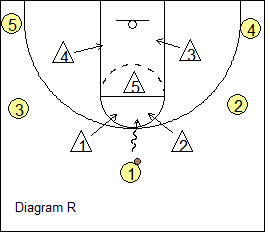 O4 must clean up the back-side rebound when the shot is taken from the right wing or corner. X3 is our most athletic defender who has quickness and basketball savvy and is a good anticipator and pass interceptor. Notice in diagram A that X1 and X2 play off the ball in the passing lanes with hands high. If O1 wants to pass to either wing O2 or O3, it will need to be a lob pass over X1 or X2. If O1 moves in toward the 3-point arc, then X1 and X2 move in on him. X5 is in a straight line between O1 and the basket at the high post area. Usually there will be a high-post offensive player and O5 will keep the ball out of the high post (will deny that pass). X5 also looks to help on O1 dribble-penetration. Our wing defenders X3 and X4 are out and up just a little, and look to intercept lob passes inside or to the corners. X3 and X4 have to be careful not to get too high, which could allow the pass inside. Notice in diagram B that O1 is a little to left side. This could happen after O1 dribbles to one side, or could be the natural offensive alignment in a 4-out offense. Here, X1 forces O1 to the left side and the zone shifts a little toward that side. X5 is in a straight line between O1 and the basket, and X3 slides to the lane line. Diagram C shows O2 with the ball on the right wing. 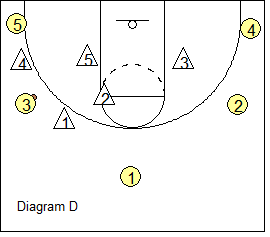 As long as O2 is off the 3-point line, X2 and X3 play the passing lanes with hands high. So if O2 passes back out to the point O1, it will have to be a soft high lob pass over X2. Similarly, a pass to the O4 in the corner would have to be a lob pass over X3. A lob pass is easier to intercept or tip, and takes longer to reach the receiver than a straight-line pass, allowing a little more time for our defenders to rotate. Again, X5 is in a straight line between the ball and the basket. X1 keeps the ball from being passed into the middle or high-post, and X4 looks to intercept or defend the skip pass to either O5 or O3. Diagram D shows O3 with the ball on the left wing and it's the same situation and defensive principles on the left side. Diagram E shows O4 with the ball in the right corner. When the ball goes to the corner, all players yell "Fire!". X5 is on a straight line between O4 and the basket, with hands high, about half-way between the ball and the basket, and stops both the pass to the low post and the dribble. Here, the passing lane to the low post is actually the same as the line of O4's dribble-penetration. X3 plays the passing lane back to the wing with hands high, forcing a lob pass to the wing. 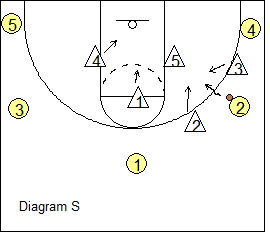 X4 sprints to the ballside low block and will 3/4 front the low post from the baseline side. In "Fire", we want our guard defenders X1 and X2 to be very aggressive, looking to intercept the pass out of the corner. X2 will try to tip or intercept the pass from the corner to either the high-post, or to the wing O2. X1, while in a position in the paint to help prevent the pass inside, will look to tip or intercept the skip pass from the corner to either the point O1 or the opposite wing O3. X1 and X2 read the shoulders of the passer O4... if O4 turns his/her shoulders outward, X1 and X2 are looking for the skip pass. If the shoulders remain square to the hoop, the pass will probably go into the post, or be skipped to the opposite corner. Would we ever have X3 and X5 trap the corner? Yes... if we sense that O4 tends to panic with the ball and doesn't handle pressure well. A skip-pass is usually a two-handed overhead pass that goes across the court, two or more players away from the ball. The rule on skip-passes is that the defender closest to the ball takes the ball. Diagram F shows the defensive rotation on a skip-pass from O4 in the corner to the opposite wing O3. Remember, our defenders were in the positions seen in diagram E.
When the skip-pass is made, they sprint to the positions seen in diagram F. X1 plays the passing lane between O3 and the point O1, while X4 sprints to the passing lane between the wing and the corner (if there is an offensive player there). X5 sprints to get in line between the ball and the basket, and, if there is a low post offensive player on that side, fronts the low post. 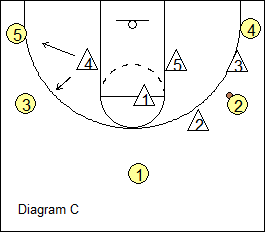 X2 moves to the high-post, while X3 drops inside to the weakside low lane-line area. X3 looks to intercept a skip-pass back to either O4 in the corner, or to O2 on the right wing. The rule on dribble-penetration is "sink and clutter"... defenders sink and collapse inside and clutter the inside, forcing the pass back out. As discussed previously, when the ball is a few steps outside the 3-point arc, our perimeter defenders play the passing lanes and not the man with the ball (diagram R). But as soon as O1 makes the dribble from the top, both X1 and X2 collapse in on O1, taking an angle back and in to stop the penetration. X5 is also there. And both X3 and X4 sink inside the paint. Diagram S shows dribble-penetration from the wing O2. X2 and X3 sink and collapse on O2 and X5 holds his position on the line. We never want X5 running out too high on any dribble-drive move, whether from the wing or the top. 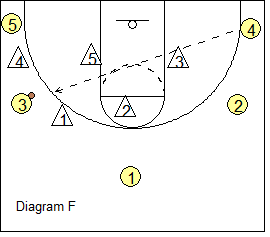 X4 sinks to prevent the pass to the weakside low post cutter, and X1 sinks into the middle of the paint. The "twilight zone" or "Buzz" must be played aggressively and defenders must work very hard and sprint to their spots. A truism... "It's not the first pass that beats you, it's the second pass" (due to slow rotation). Trapping... we usually are playing the passing lanes and not trapping (unless the ball is at the 3-point arc or is dribbled inside). Once the ball gets to the 3-point arc, we aggressively collapse on the ball and trap... same thing applies to dribble-penetration. Defenders are also taught to be "basketball players" and if they sense that an offensive player(s) is panicking, they may aggressively trap the ball. Keep the 2-3 defense "wide" horizontally. This stretches the offense. Staying "wide" keeps the ball wide. 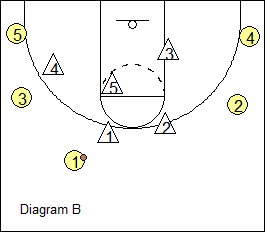 But the closer the ball moves to the basket, the closer the wings X3 and X4 must play inside. And we "sink and clutter" on dribble-penetration. Giving up 3-point shots. Yes, teams will shoot more 3-point shots, which is really what we want. Usually the 3-point shot is a lower percentage shot, especially if the defender gets a hand up, and then we look to rebound and get our fast-break going. Teams with very good shooters, who work the dribble-drive and kick-out very well can be a problem when they are hitting their shots. Here, we have to adjust to close-out actually on the ball when it goes to a great shooter. And we may try to trap their shooters instead of playing the passing lanes, while playing the passing lanes on non-shooters. Coach Divilbiss has found that some shooters seem to be bothered mentally by this unusual defense. As an offensive player, I am used to seeing a defender in front of me, and to see two adjacent defenders playing the passing lanes, and almost "inviting" me to shoot, can be confusing... I'm not sure whether to dribble-drive the gap, or shoot the outside shot. And when there's indecision, shooting success usually drops off. The "Twilight Zone" ("Buzz") is probably not your only half-court defense. You might mix things up and play pressure man-to-man defense, or a standard 2-3 zone defense, in addition to the "Buzz". Mix things up, confuse the offense. Get the DVD! If you are serious about using this defense, you must get Coach Mike Divilbiss's excellent DVD. The DVD shows on-court 5-on-5 demonstrations of how players play the passing lanes, rotate, etc with Coach Divilbiss stopping play and making comments and corrections.